But, if you’re spiking with alcohol like Lynn’s recipe and making them for grownups – they’re the perfect adult weekend activity. Another note – when making these for kids, I’d say keep them to a small, silver dollar size. The bigger the lollipop, the bigger the risk of getting giant shard like pieces of hard candy “glass” when they inevitably bite them. I had to learn that the hard way, since I got carried away and made them pretty enormous. 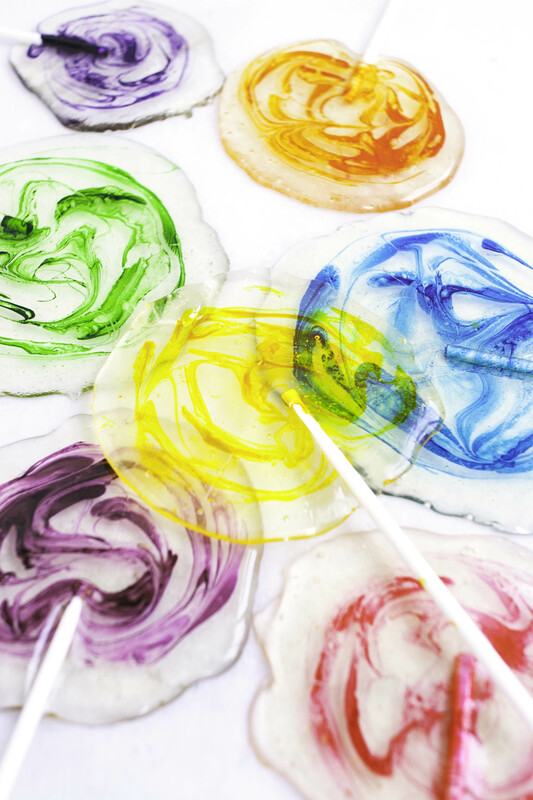 Another thing I love about these Homemade Lollipops is that the flavor possibilities go on and on. 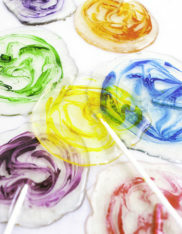 You can really flavor them with whatever extract you like – lemon, lime, orange, cherry, peppermint, vanilla. Amazon has a whole bunch of tropical extracts, too. What would we do without Amazon!? I promise I’ll post a “real food” recipe next time. Between my boys’ birthday celebrations and the baby being sick there hasn’t been much time for me, but we should be back in business! Place 3 large pieces of parchment paper on baking trays - lightly spray with cooking spray and brush with a pastry brush to evenly coat the paper. Place the sugar, water and corn syrup in a medium saucepan over high heat. Gently stir until the mixture comes to a boil - be careful not to splash it up onto the sides of the pan. Continue to boil over high heat until the temperature just about reaches 300F (hard crack) and then turn off the heat and allow the mixture to cool to 275F. *If the mixture goes above 300F, it will begin to caramelize, which will still be delicious, but won't look clear. I turned my heat off just before it reached 300F because it does continue to rise for a minute or so. Once the mixture has cooledto 275F you can add in your extracts. Using a metal ladle, pour out 2 circles at a time onto the parchment paper. These are not going to be perfect circles, but they'll be cool free form circles. 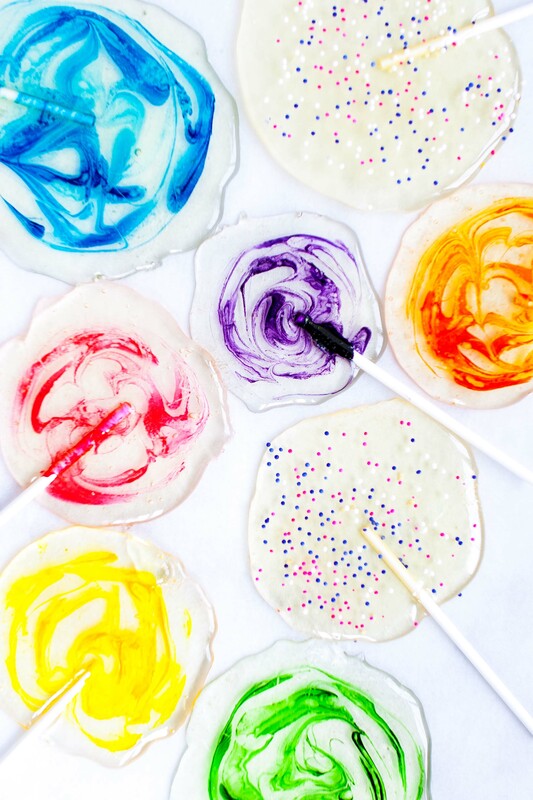 Next, dip the end of the lollipop stick into your desired gel food coloring and twirl the stick around the surface of the pop until you're happy with the design. Then set the stick down flat onto the circle and spin it to ensure it's coated in sugar. Continue with the remaining hot sugar. If it starts to become stiff and hard to work with, heat it over low heat - but be sure not to stir it too much or it will become opaque. Allow to cool for about 20 minutes or until totally solid.